The perfect gift! Tumbled Stones in crystal-clear jars or in a burlap drawstring bag. Get a free identification guide with each jar or bag purchased. The perfect way to give tumbled stones as a gift is in a crystal-clear jar that displays their beauty or in a drawstring bag that provides perfect storage. Stick a bow on the lid of the jar or tie a tag to the bag and your present is ready! The stones in these jars and bags are our medium size. They measure approximately 5/8 inch to 1 inch along their maximum dimension. This is our most popular size of stones, and they can be used for a wide variety of tumbled stone crafts and activities - we show plenty of examples here. 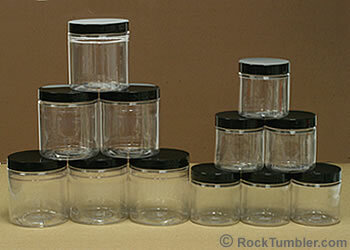 The jars are thick-walled and made of a durable, crystal-clear PET plastic. 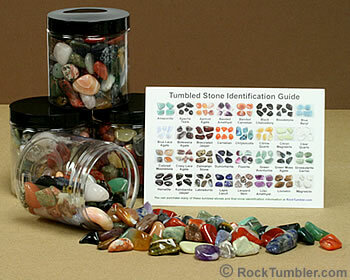 Tumbled stones in a crystal-clear display jar make a perfect gift. Each jar contains one pound of medium-size tumbled stones that measure approximately 5/8 inch to 1 inch along their maximum dimension. One pound of stones usually contains between 70 and 110 stones in a number of different varieties. 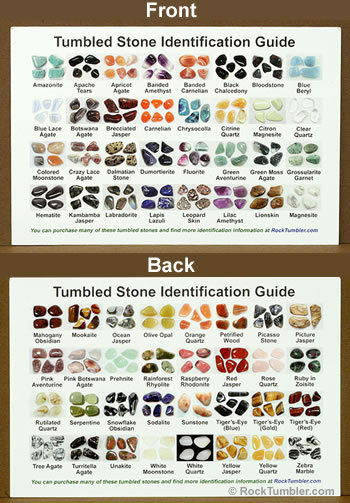 With each jar purchased, we will include a copy of our "Tumbled Stone Identification Guide." The guide will enable you to identify many of the stones in your jar. 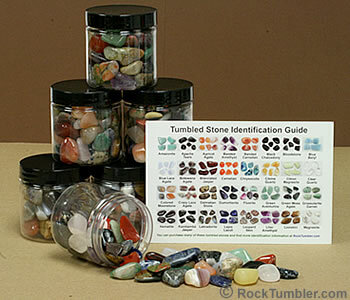 Please note: Your jar will not contain every stone shown on the identification guide. And, there may be a few stones in your jar that will not be identifiable using the guide. Tumbled stones in a crystal-clear display jar make a perfect gift. Each jar contains 1/2 pound of medium-size tumbled stones that measure approximately 5/8 inch to 1 inch along their maximum dimension. One-half pound of stones usually contains between 35 and 55 stones in a number of different varieties. Tumbled stones in a drawstring burlap bag is a great gift. Each bag contains one pound of medium-size tumbled stones that measure approximately 5/8 inch to 1 inch along their maximum dimension. One pound of stones usually contains between 70 and 110 stones in a number of different varieties. 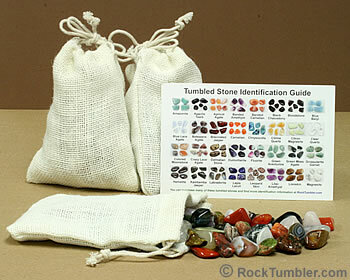 With each bag purchased, we will include a copy of our "Tumbled Stone Identification Guide." The guide will enable you to identify many of the stones in your bag. Please note: Your bag will not contain every stone shown on the identification guide. And, there may be a few stones in your bag that will not be identifiable using the guide. We knew that many people would want to buy these beautiful jars for other gift and craft uses, so we offer them here in packages of six. The large jars are an 8-fluid-ounce size, and the small jars are a 4-fluid-ounce size. They are thick-walled jars made of durable, crystal-clear PET plastic. Jars of colorful stones look great on your desk, or counter or shelf. The jars are also a perfect way to display or gift a wide variety of other items. 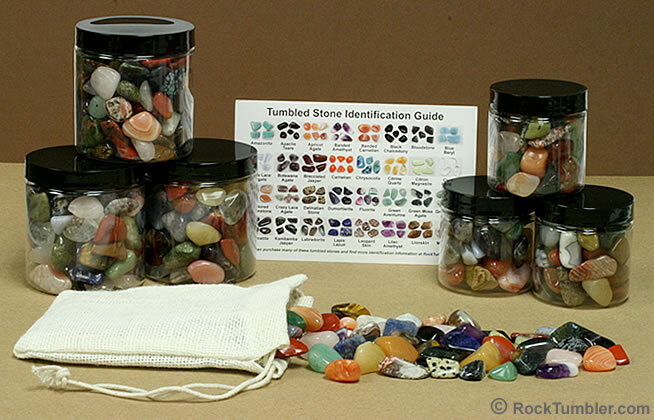 Many customers want to know how to identify the tumbled stones in our mixtures. They want a simple method to determine their names. This guide will help you identify many of the stones in our mixtures by visual comparison. To identify a stone, simply compare the color and pattern of the stone to the photos on the chart. The chart works because our stone mixtures contain mainly varieties of agate, quartz and jasper that have names based upon their color and pattern. The mixtures also contain a few other stones that are visually distinctive. 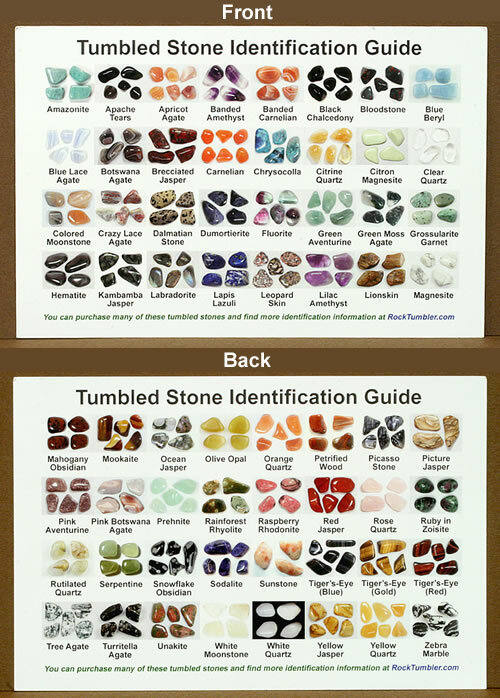 Please note: The chart will not make you a gemologist who can identify any type of stone from anywhere. However, it will enable you to identify many of the stones that we sell.